It's no secret that I love a good book. And as much as I love to blog, write, and play in my makeup, I love to read more than any of these things. If you've been reading here for a minute, you may even remember when I used to have a book blog! Every since I participated in last summer's reading challenge over at a Semi-Charmed Kind of Life, I've been a bit more open-minded about my selections. And since I no longer have a book blog, I decided I would start sharing more about what I'm reading here. Below is a roundup of some of the books I've read in recent months. Stargirl | Jerry Spinelli- I love it when YA fiction delivers such a profound message, anyone who reads can relate to it. In reading Stargirl, I was reaffirmed that it's okay to stand out in the crowd and go against the norm. It's easy for me to say, as I am no longer a middle school kid dealing with finicky friends and peer pressure. I definitely recommend this if you are looking for a read that celebrates nonconformity and embraces individuality. Is Everyone Hanging Out Without Me? And Other Concerns | Mindy Kaling- Okay, I'll admit that I only read this book because I am a fan of the Mindy Project. Many memoirs were floating around at the time I purchased this book (Bossypants, Yes Please, Not That Kind of Girl), and I decided to try my hand at one of them. Mindy won, hands down. And boy, is she hilarious! I enjoyed reading anecdotes about Mindy's life and finished this one up in about a night or two. Pick this one up if you're looking for a light read full of humor. 32 Candles | Ernessa T. Carter- This one may have been my favorite read for 2014. In 32 Candles, I was introduced to one of my new favorite characters, Davie Jones. Davie is a reclusive teen who can't seem to catch a break at school or at home with her abusive mother. She often seeks solace in watching her favorite 80's movie 16 Candles, hoping her life would have a happy ending similar to Molly Ringwald's. But after being teased mercilessly and becoming the focus of a terrible prank in high school, Davie runs away and starts an entirely new life cross country. Life is all good until her past comes to reintroduce itself in the form of her first crush. It was quite interesting to watch all that drama unfold! The Awesome Girl's Guide to Dating Extraordinary Men | Ernessa T. Carter- I wish I would have known about 32 Candles before I read The Awesome Girl's Guide. 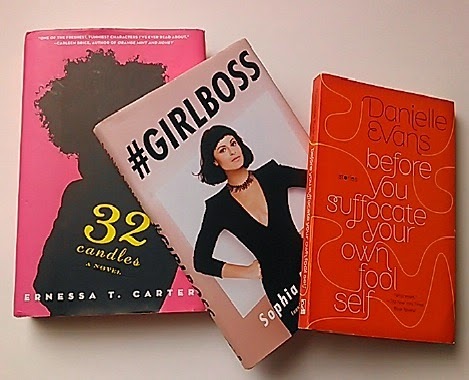 Also written by Ernessa T. Carter, The Awesome Girl's Guide to Dating Extraordinary Men basically centers on a fictitious self-help book of the same name written by the infamous Davie Jones of 32 Candles. Each unmarried and approaching their 30th birthday, four single girlfriends decide that this will be the year that they will meet the loves of their lives. Per one of the girls' suggestion, they decide to navigate through the world of dating using advice from Davie's book. This book will make you laugh, tear up, and will even shock you with a plot twist or two. Check it out, as it's definitely worth the read! The Fault in Our Stars | John Green- This book was a total tear-jerker for me last summer. I read it along with a few fellow blogger friends and boy, was it an experience. Many of you are probably already familiar with this read (and even the movie adaptation), so I won't gush over it too much. But I will say keep your tissues handy as you read this book. It's such a beautifully written love story. Page by Paige | Laura Lee Gulledge- I saw this gem at my local Dollar Tree and had to have it. What I discovered was one of the most beautifully written and illustrated graphic novels I have ever read. I was introduced to Paige Turner, a teen who isn't too pleased about moving to the big city with her parents. Paige misses her old friends and has trouble adjusting to her new life in New York, bumping heads with her mother as teen girls sometimes do. It isn't until Paige meets a crew of teens in which she shares a common interest in art with, that she begins to embrace her lifestyle change and all it has to offer. This is a great read for anyone who too has experienced resistance to change or has been afraid to share his/her voice (or art, or writing) with the rest of the world. #GirlBoss | Sophia Amoruso- Sophia Amoruso, founder and CEO of Nasty Gal, shares her unconventional road to success in this book. She stresses that through hard work and utilizing your strengths/skills, you can accomplish whatever you put your mind to. This is a must-read for any ladies out there who wish to start their own business. Amoruso gives you a powerful push with this read. Before You Suffocate Your Own Fool Self | Danielle Evans- Have you ever read a short story collection and found yourself totally invested in ALL of the main characters? That was my experience in reading this book. I loved each story and found myself traveling to different cities with each character. As the stories came to a close, I needed to know more about how their lives developed. I wanted to know they would all be okay. Now that's unusual for me, someone who will skip a story in a collection if I cannot relate to the characters. If you're a fan of short story collections as I am (and you make a habit of caring for characters you've only known for five minutes lol), you don't want to pass this one up. Looking Fly On a Dime | Patrice J. Williams- This gem is a thrifter's dream! I've been reading Patrice J. Williams' blog by the same title for quite some time now. So when I saw on her Instagram that she had dropped a book, I knew I had to have it. It's chock full of tips, tricks, and great advice on the art of thrifting great pieces. I learned so much from this short + sweet read and I encourage all of my fellow thrifting divas to check this book out as well. Yes, Please | Amy Poehler- After reading Mindy's book, I had to see what Amy Poehler's book was all about. I've learned a lot about the woman I've grown to know from SNL skits. And while she is a pretty funny lady, I found her essays about parenting and growing up straight-forward and surprisingly easy to relate to. Quick, fun read for sure. What I Know For Sure | Oprah Winfrey- This book is full of gems that anyone could apply to their everyday life. Many of the life lessons she shares are things we have probably heard a million times over. But reading this book was refreshing, as it brought these lessons back to my mind. Through her short-and-sweet essays, Oprah reminds us to remain humble, practice gratitude, and share our love with others freely (even if we have been hurt). What I Know For Sure is definitely a book that one could refer to time and time again for the occasional pick-me-up. If you have suggestions and recommendations, I would love for you to share them with me in the comments! And if you are interested, I have an ongoing reading list here on the blog. I'm always looking for reading buddies, so if you have some of the same books on your reading lists, I would love to schedule time to read with you!